The 22-year-old from Russia beats Marton Fucsovics in straight sets to clinch his fourth ATP Tour career title. 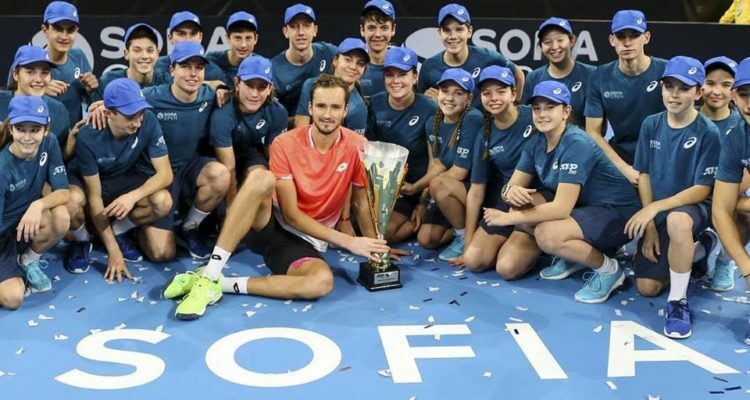 Daniil Medvedev is the champion of the 2019 Sofia Open. The 22-year-old Russian wins his fourth ATP Tour career title after a 6-4, 6-3 final victory over Marton Fucsovics of Hungary on Sunday afternoon at Arena Armeec. Medvedev sent down six aces, winning 70 per cent of his first service points. He broke his opponent four times to seal victory in one hour and 21 minutes. Medvedev went 3-0 in finals last year (Sydney, Winston-Salem, and Tokyo) and picked up his first title of the season after a finalist showing in Brisbane in January. Medvedev takes away 250 ATP Ranking points and €90,390 in prize money for his efforts this week. Fucsovics picks up 150 ATP Ranking points and €48,870. Earlier in the day, Nikola Mektic of Croatia and Austrian veteran Jürgen Melzer lifted their first team title. They defeated Cheng-Peng Hsieh from Taipei and Christopher Rungkat from Indonesia 6-2, 4-6, 10-2 in the doubles final. The encounter lasted one hour and seven minutes. “I am very happy to win the title,” added Mektic. “Last May was my last final, so it is very good to be in a final and win again… It is going to be good motivation for the rest of the season. This entry was posted in ATP 250 Sofia, ATP Tour and tagged ATP Tour, Daniil Medvedev, Sofia Open.